Getting a brand new kitchen had been a goal of mine for quite some time. 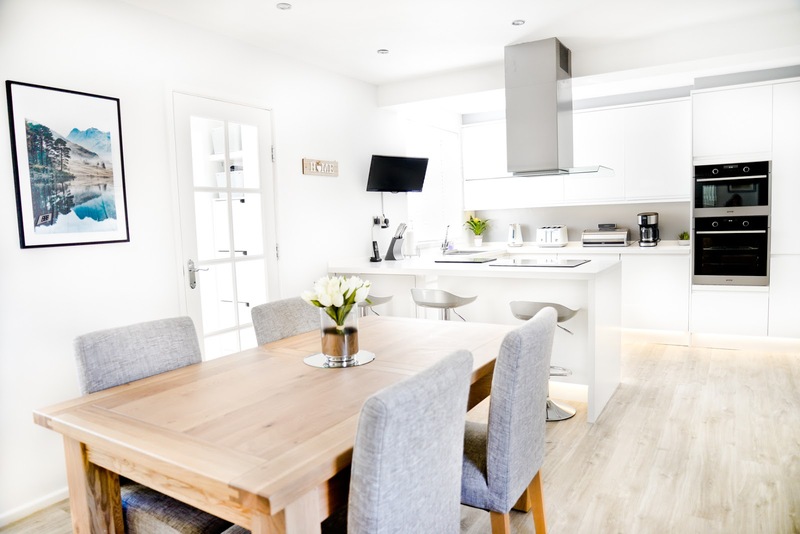 I always dreamed of a white kitchen with a grey oak laminate floor and my Husband and I were always pinning our dream kitchens over on Pinterest, (luckily we both agreed on the type of kitchen we'd one day like to own). Earlier this year, after years of saving and dreaming, our dream became a reality - we finally got a start date on not only our kitchen makeover but also a two storey front side extension to go with it. Which has not only increased the size of our kitchen and dining space but has also given us a much bigger bedroom upstairs in the room that used to be our box-room, as well as a nice sized porch and a front door on the front of our house, rather than on the side like it was before. Getting to the stage we are now, where we are no longer having builders here every single day, living without a kitchen and with holes in the side of our house, plus spending all of our savings, hasn't been smooth sailing, but the end result has been so, so worth it all because we are absolutely thrilled with how it all looks - it's exactly what we had envisioned and even more some. Whilst we were planning our extension, I honestly didn't think we were going to gain as much space as it feels like we have. I actually didn't think that there was enough room to even add an extension on considering we had to leave a metre boundary from our neighbour. But I was proven wrong because the space that we have now is amazing. 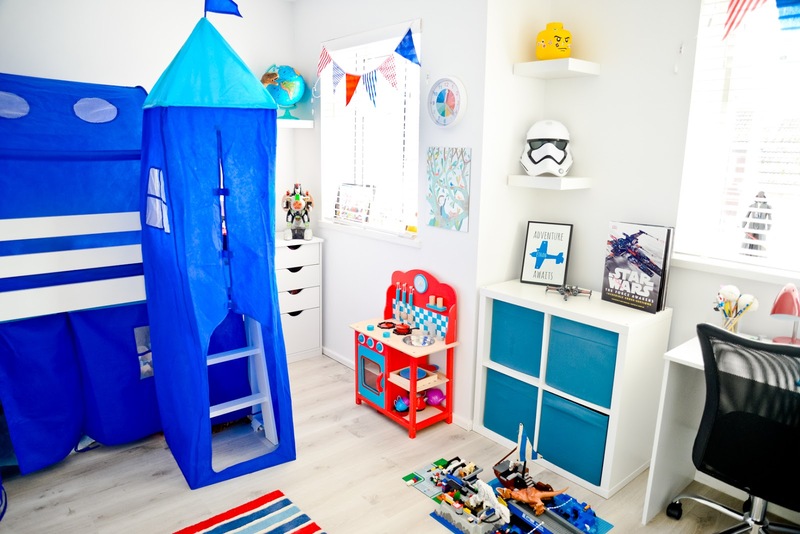 Ethan's new bedroom feels enormous compared to the little box room that it was before and our downstairs kitchen and dining area is so much bigger than I ever imagined, it's the perfect family space for us all. We've even got enough room to host Christmas here this year now, which I'm so excited about! And the porch is also far bigger than I imagined that it was going to be, we've been able to fit so much out there and it doesn't look or feel cramped in the slightest. 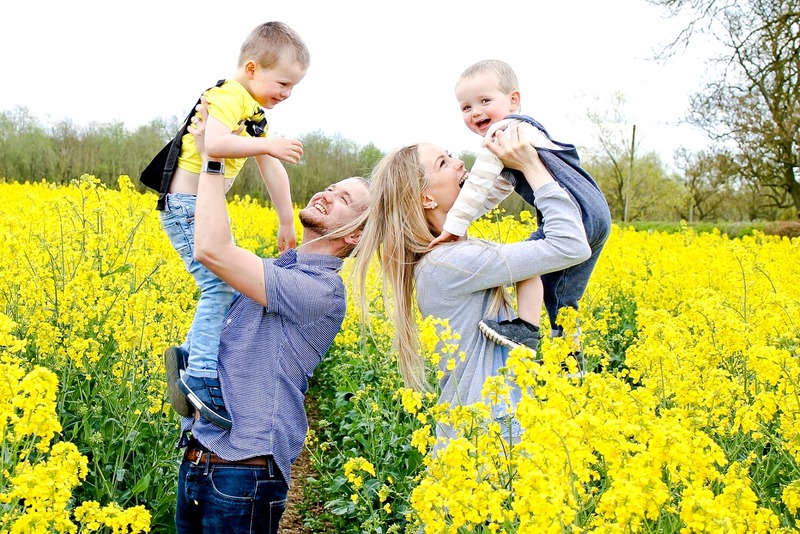 We feel so fortunate to have been able to save enough to have made our home our dream family home, I would definitely recommend to anyone else thinking about renovating their home or adding on an extension to go for it. It's not the easiest to live through, but the stress is temporary whereas the end result is something that you'll enjoy for years and years to come. Below I've shared some details on our new kitchen as well as where some of the things are from. If you wish to you can see what our kitchen looked like before the renovations here: House renovations: The BEFORE and plans. And you can follow what the renovation journey looked like for us via my home playlist on my youtube channel. 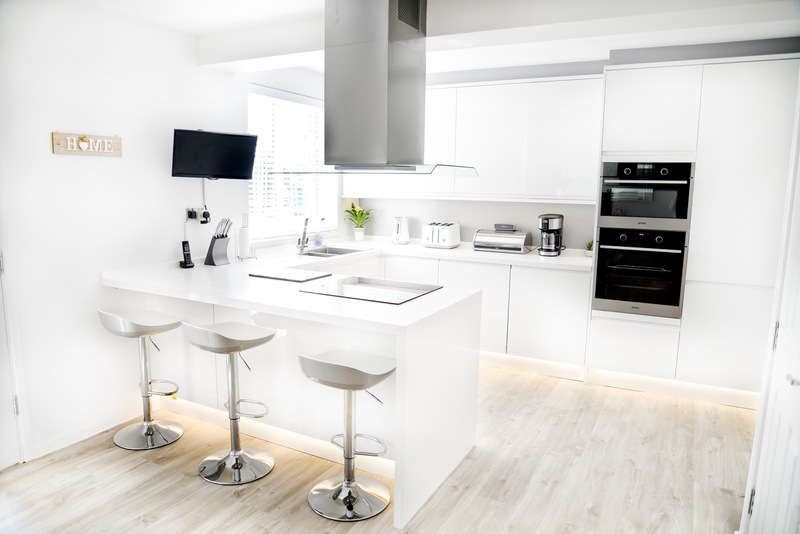 Our kitchen units, which I adore, are white gloss and handleless and they're from the Clerkenwell Gloss range at Howdens. We went for extra tall units as we wanted them to reach near the ceiling for a more built-in finish. The units are really good quality and with a microfibre cloth and some method, I find them quite easy to keep clean. We have several smart storage units also which means that we get to use all available space and nothing is wasted. I am absolutely thrilled with the new appliances that we bought for our kitchen, we've kept the same hob from our previous kitchen as it wasn't very old, we also already had our fridge freezer and our TV, but our the island extractor hood, the microwave oven and the separate oven are all new and are from a company called Gorenje They all look really amazing together I think - I love the look of the inbuilt microwave oven and oven together. Our new touch control hood is really clever and adapts automatically to the levels of steam when we're cooking once switched on and also has an excellent energy efficient LED light. And the microwave-oven and the oven are able to hold so much - they're so spacious inside, they are actually modelled on traditional wood-fired bread ovens which means that because hot air is able to move around more freely, the food is heated evenly and from all sides and is always perfectly done. One of the things that was quite inexpensive to do, but that I feel helps to complete our kitchen is the LED lights that we've had put in around the bottom of our units. It's quite hard to show during the day on camera, but at night these look amazing and feel so cosy. Like I said above, it was a really inexpensive addition but has made such a difference. 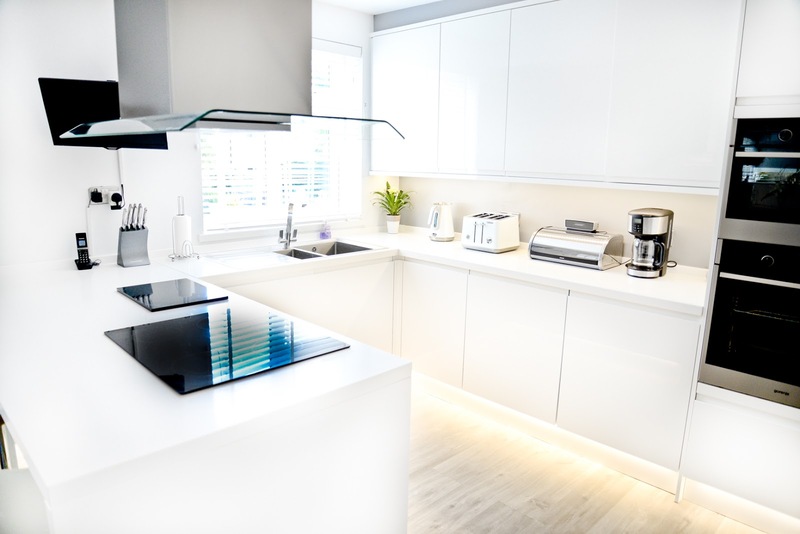 Our worktops are from a company called Maxtop Quartz and they are pure white quartz - I love them because they are so sleek and absolutely solid. 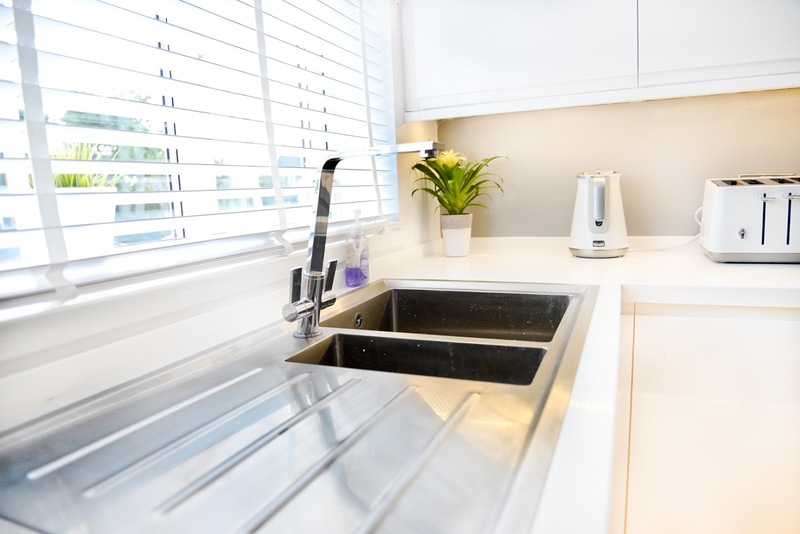 We've had these worktops in for a few months now and they're easy to clean and fantastic quality. I really struggled to find a worktop I loved before I found these and we are so happy with our choice! 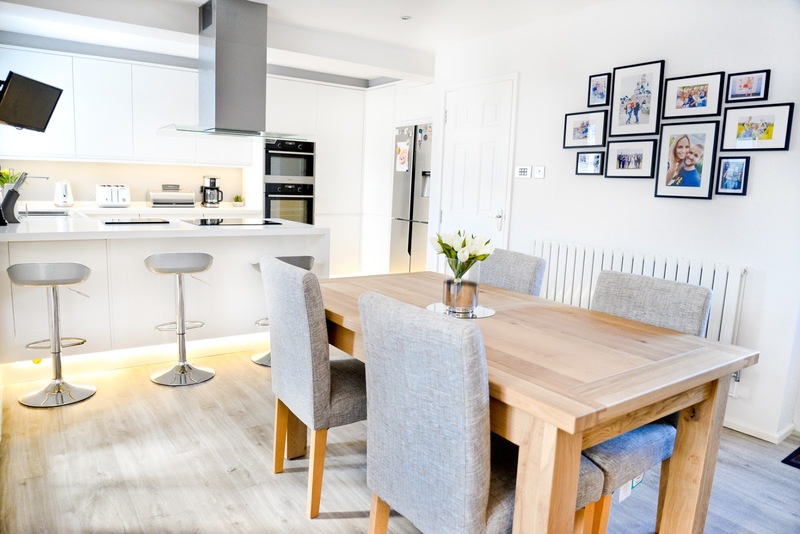 On our walls we've gone for a grey steel Dulux paint which we get mixed up, we have this throughout our home and we love how clean and fresh it feels. We also have a darker slate grey paint colour between our units and the side and also above that area too. We didn't want to tile there as we don't prepare or cook food over there because we've put our hob on our breakfast bar and so we just chose a slightly darker grey to mix up the white a bit and we feel it works really well. 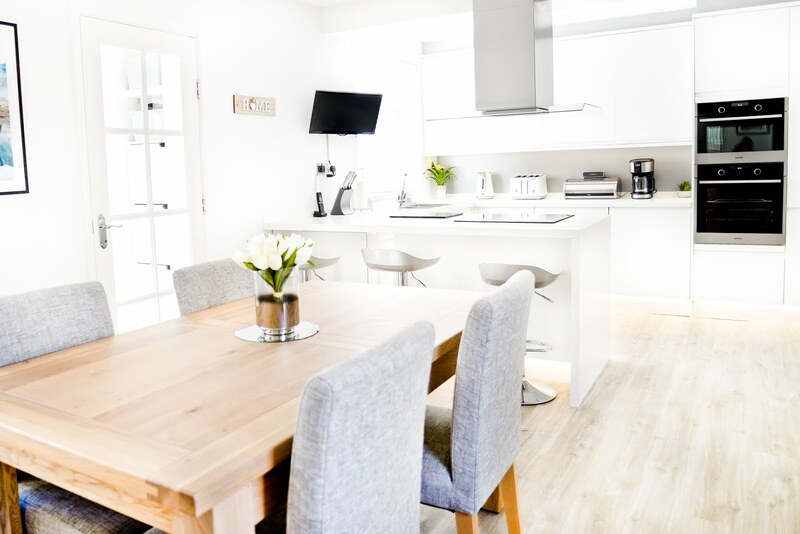 Our new breakfast bar stools are from Dunelm Mill and were such good value, they're easy to keep clean as they're wipeable and they go with the white and grey theme that we've got going on. Having a breakfast bar has made such a difference, the boys love sitting up there in the morning whilst eating their breakfast. The flooring we chose is from Quickstep and is their Canyon Oak Grey vinyl. I really like the colour against the white units. We are huge fans of Quickstep flooring - we actually have their flooring across most of our home and it's such great quality. Over on the other side of the room in our dining area space, we've gone for a solid oak extending table from Willis & Gambier with some grey fabric Next chairs. 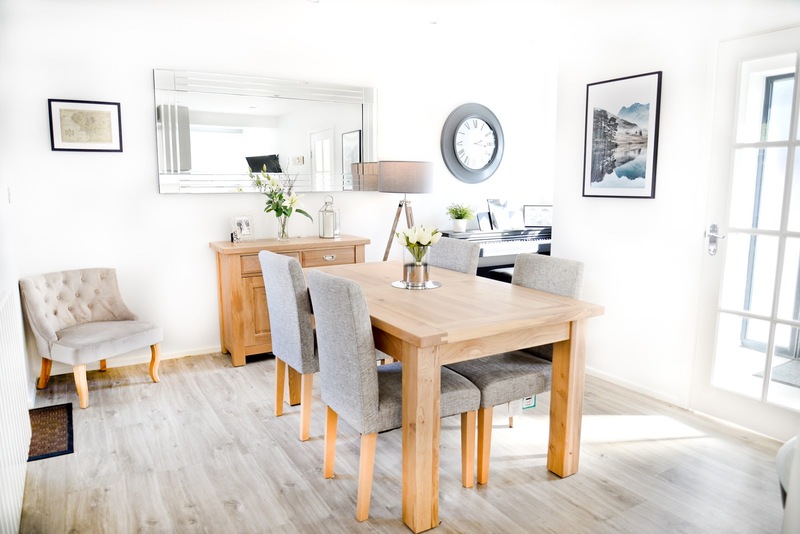 We wanted to combine our love of the modern/Scandinavian look with a bit of a modern rustic look, plus we also felt like a solid oak table was the perfect choice for a family table that is going to last. We looked around for ages for the perfect table and the found it online and fell in love with it straight away. The only downside with it is that the lacquer on top seems to mark a bit too easily, but we love the table too much to want to send it back. It extends to a really big size and will be perfect for Christmas this year. We also decided to get the matching side table to go with it and we're so pleased that we did as it can hold a lot more than I thought it would. We've got all of our board games, puzzles, mats for the table and more in it! 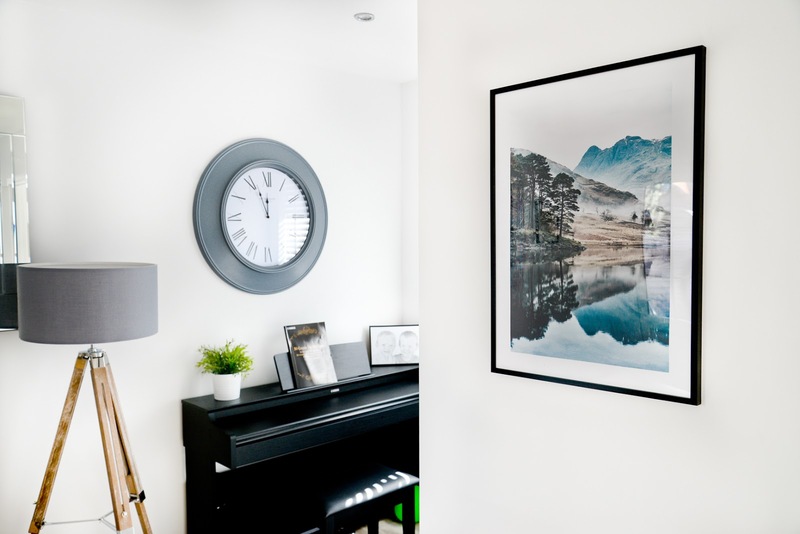 For the wall decor, we chose our favourite wall art/frames company, Desenio and ordered a lake reflective print from them as well lots of their frames to create our own photo gallery wall. We also ordered a large mirror from a site called decorativemirrorsonline.co.uk to help fill the big wall space at the back of the room. 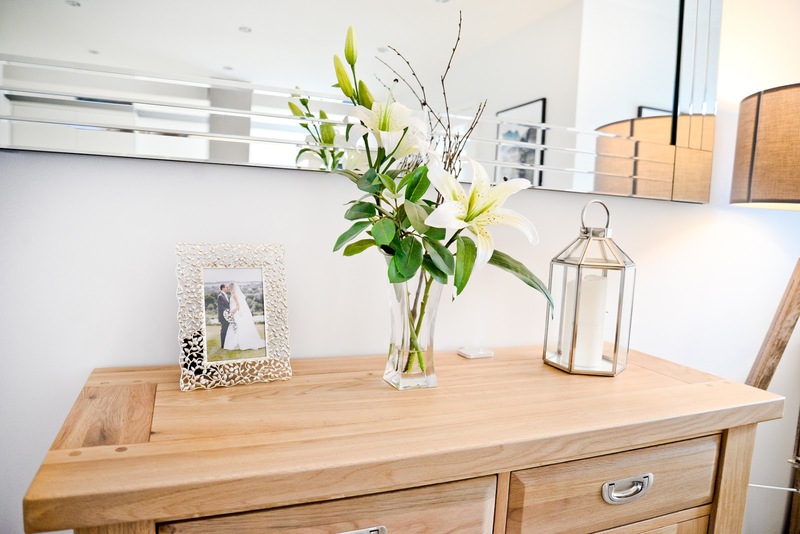 I am a huge fan of using mirrors as I feel that they bring more light in and also help make rooms appear bigger than they are. 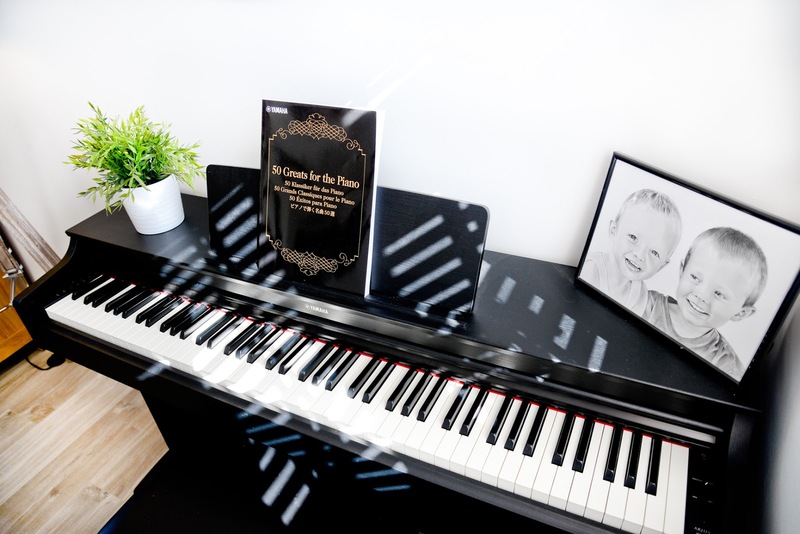 My Husband Adam really enjoys playing the piano and so it was a dream of his to have enough room in our house for him to have his own for him to practise on and learn new songs. With the extra space that we gained, this was possible and so he bought a Yamaha keyboard which he uses daily and absolutely loves. The framed drawing of the boys on top of it is by the VERY talented Sammy Bird Art, check her out on Instagram if you haven't yet seen her incredible drawings! Our new clock, which I've nicknamed Big Ben, was a random find in Dunelm Mill and I really like it! We also bought the vase and flowers that sit in the middle of our table from Dunelm Mill. As well as our new chair that sits in the corner of the room. 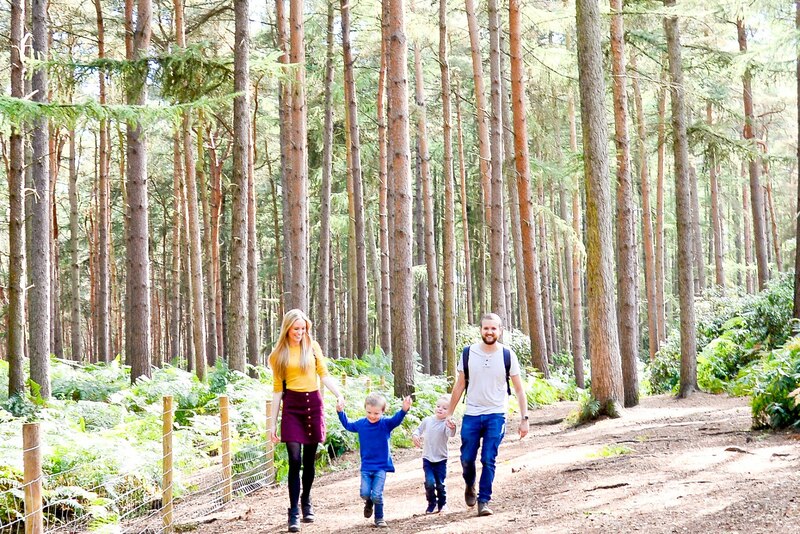 I was surprised at how much we actually ended up getting from Dunelm Mill, it's not somewhere we usually think to go and look for homeware bits, but it ended up being one of the best places. I hope you've enjoyed looking around our new kitchen/dining space. We are absolutely over the moon with it - it still feels a bit like a dream whenever we go downstairs in the morning. A huge thank you to NP Mead Kitchen and Bathrooms for all of their hard work on both our extension and our kitchen. I'm so glad we decided to get it done! Oh my goodness. I love the Scandinavian style. This looks like a dream kitchen! I love this look. When we got our kitchen done last year we went for white granite worktops and a light grey colour for the units. Its made the kitchen so much brighter than before. 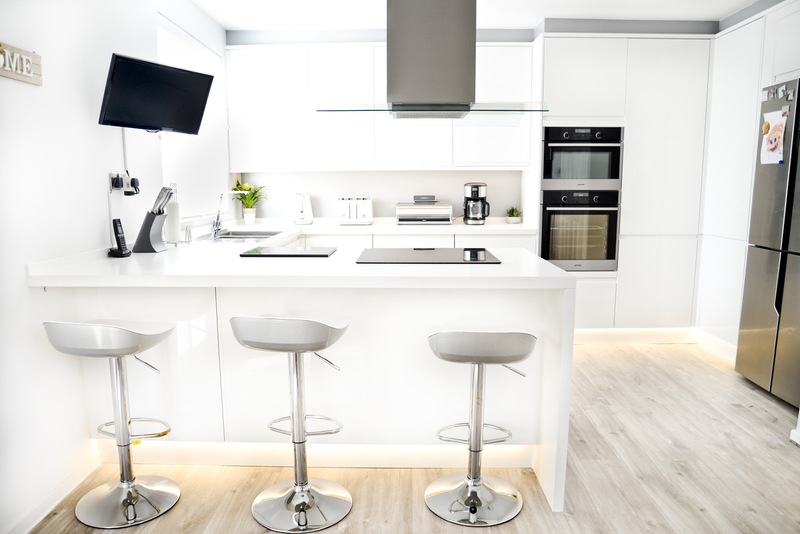 I love your kitchen, it looks amazing and so sleek! 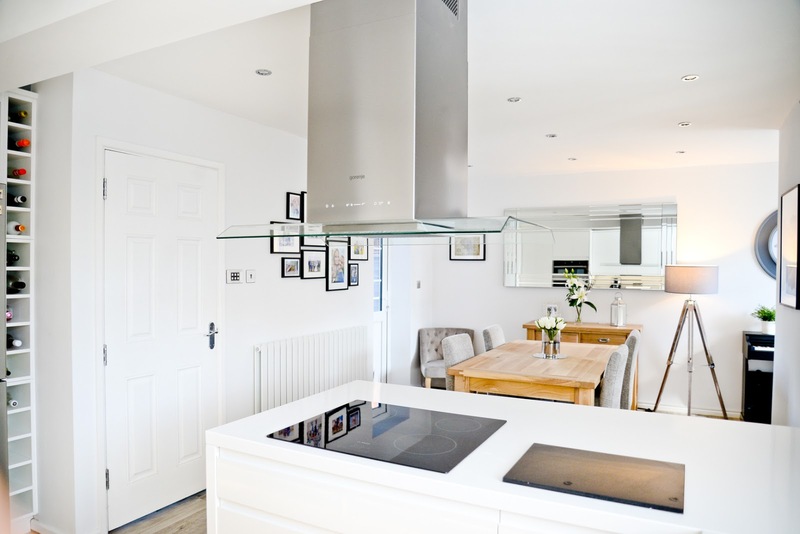 Oh my goodness, I have such kitchen envy! You've got such a beautiful home! Wow, I am so jealous. It’s stunning. I like the idea of the lights under the units! Wow, what a beautiful kitchen! This looks amazing, I love it! What a beautifully clean design! 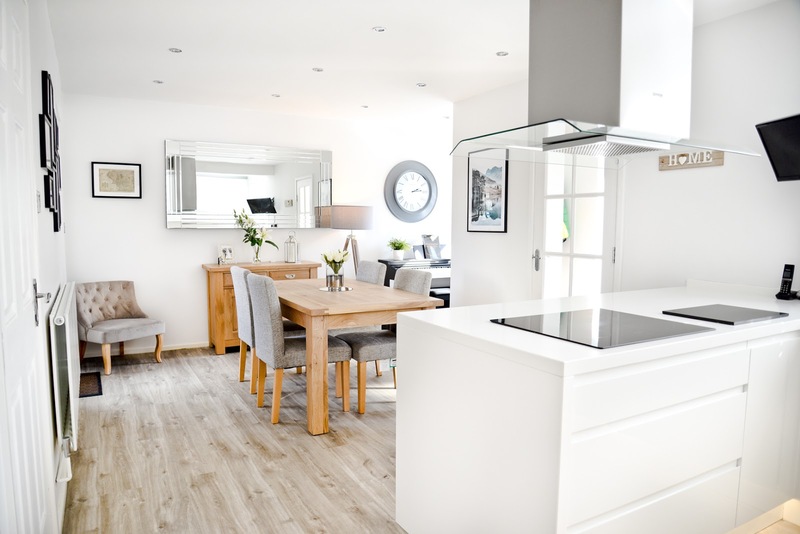 I absolutely love your kitchen, and the large mirror in the dining area is a perfect addition!